If you’re going to keep dance, you might as well get better each time you do it! That’s the Asian in me talking. 🙂 We want results! Even if it’s just some improvements, here and there. Over time, they all add up. So if you are guilty of any of these Mistakes, that’s ok. ​NOW is the time to fix it. You can do it! Imagine your 2 feet with paint brushes as toes, and you will keep those paint brushes on the floor as you dance your steps. 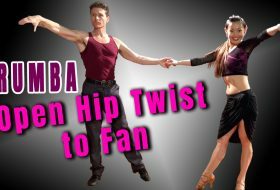 Save the “taking feet off the floor technique” for JIVE! So, leave the heel leads to your waltzes, foxtrots etc., and keep them out of your Latin dances (except Paso & a few steps in Samba)! If you keep your toes/ balls of the feet on the floor, this will prevent heel leads. Say Goodbye to “Back-weighted” and Hello to “Forward-weighted”. Keep your body weight over the ball of the foot you are standing on. Bonus: Sometimes, students will ask if that means that you need to keep your heels lifted? That’s not the case! Your foot is still flat on the floor, but you carry your weight over the front of the foot. A good way to check if you are doing this right, is to see if you can lift your heel off the floor easily (like doing a heel raise). Say this after me: “When I take a back step, I will move my leg first, then my body will follow”. Very good! Now, do what you said. 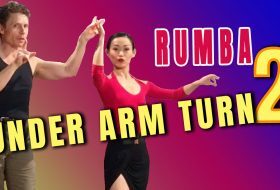 Quick Fix #5: Count 1, then step on 2.
International Rumba timing is 2, 3, 4 and hold the 1 count. 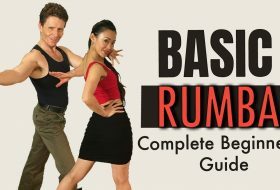 So, practice counting to a song, and doing the rumba basic. Make sure you count 1, 2, 3, 4, 1 then step on 2. Remember: It’s not practice that makes perfect. It’s practicing the right things, that makes perfect. Build awareness in what your body is doing, so you can correct the mistakes. Be in the moment and consciously practice each thing, so that you feel what it’s like to do it correctly, and what it’s like to do it incorrectly. If I can do it, so can you! Looks like Li Wen is having fun making mistakes for these GIFs! Haha! Thank you to both Tytus and Li Wen for this! It is actually helpful to have a GIF of the correct steps. Your video drills are fantastic! I can’t always make it to the studio for lessons. Is there away to purchase your instructions by CD or You-Tube? Thanks Rick! We are adding content and lessons to this site regularly. If there is something specific you’d like to learn, let us know. 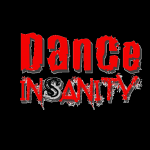 In the meantime, check out our youtube videos on our channel: http://www.youtube.com/danceinsanity. 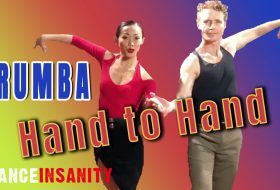 Our “Revenge of the Rumba” DVD also has lots of drills and exercises to improve dance technique – you can buy it on our site. Happy Dancing!